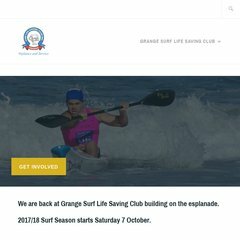 Topics: Grange Surf Life Saving Club, Junior Activities, Senior Activities, The Surf Club, and Sponsors. It is hosted by Ossini Pty Ltd New South Wales, using Apache/2 web server. Its 2 nameservers are ns2.vintek.net, and ns1.vintek.net. The programming language environment is PHP/5.2.17. PING (223.25.224.23) 56(84) bytes of data. A time of 240 ms, is recorded in a ping test.